Callum Saunders scored the only goal, a penalty, in Haywards Heath Town's 2-1 home defeat against Guernsey on Saturday. All pictures by Grahame Lehkyj. Haywards Heath Town 'had enough to chances to win three games' according to boss Shaun Saunders, as the Blues fell to a 2-1 home defeat against Guernsey in the Bostik South East on Saturday. A second half Thomas Dodds double for the Green Lions gave them the lead before a Callum Saunders penalty reduced the deficit late on, but the visitors held on to win. Heath's Kane Louis gets the ball under control. Heath have now gone four league games without a win, with their last victory coming away to Horsham on December 22. Saunders rued his sides profligacy in front of goal but remained positive about his team's performances in their debut season in the Bostik South East. He said: "We had enough chances to win three games. Their goalkeeper was outstanding. Haywards Heath's Karly Akehurst controls ball. "The goalkeeper made four or five outstanding saves on Saturday and on another day, they go in and we win comfortably and everybody's happy. "If we weren't creating chances I would be more concerned but we created so many chances. It just wouldn't fall for us." Guernsey's Callum Stanton was the busier of the two goalkeepers in the first half as Haywards Heath carved out numerous chances. Melford Simpson, Alex Laing, and Karly Akehurst all had multiple opportunities to score but Stanton was on hand to frustrate the Blues. Callum Saunders (number seven) beats Guernsey 'keeper Callum Stanton from the penalty spot. Heath finally beat Stanton before half-time, when Sean Roddy's brilliant ball found Laing but his volley hit the outside of the post. The loose ball evaded the arriving Josh Spinks as the half finished 0-0. Four minutes after the restart the visitors took the lead. 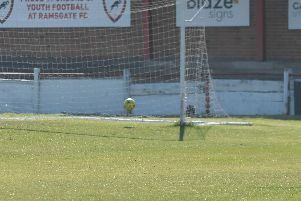 The home side failed to defend a Guernsey corner and Dodds tucked home from close range. The Blues responded, but Akehurst and Nathan Cooper were denied by the superb Stanton. These misses were to prove costly as Dodd added his second. His 20-yard strike beat Josh Heyburn in the Heath goal to double the lead on 72 minutes. The hosts were given a lifeline as they were awarded a penalty six minutes from time for handball. Callum Saunders duly stepped up and converted but the Blues couldn't force an equaliser as they crashed to defeat. Saunders added: "I'm happy that we've been creating a lot of chances. It was disappointing but on another day things will go our way. "The lads put in a fantastic shift on Saturday and felt really hard done by. In all games that we've come out second best, we've really worked hard and put a shift in. "We haven't been well and truly beaten this season I feel. We've given a good account of ourselves and we're in a great position in the league so it's all positive our end." Haywards Heath Town host Chichester City tonight (January 22) in the semi-finals of the RUR Cup, before travelling to Sittingbourne in the league. Haywards Heath: Heyburn, Roddy, Robinson (Miller 70), Napper, Cooper, Spinks, Saunders, Louis, Simpson, Akehurst, Laing. Unused: Bangura, Folkes, Gray-Branford.